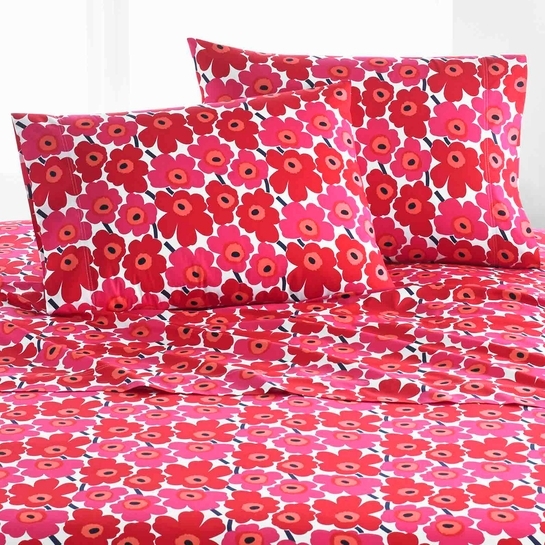 More about Marimekko Mini Unikko Red King Pillowcase Set Maija Isola's famous 1964 red poppies are scaled down to a mini size and printed on 100% cotton percale. This pair of pillowcases will only get softer from machine washing, making it a beautiful staple in the bedroom. Use this as an extra set for your Marimekko Mini Unikko sheet set or simply as a pop of color to otherwise solid, neutral sheets. About Percale: A high-quality weave, percale has a noticeably tighter weave that allows for a higher thread count which makes the sheets softer to the touch. Medium in weight, the fabric is matte with no additional sheen or shine but the texture is very smooth and able to resist warping and washes exceptionally well. Price is for pair of two pillowcases.